When you think of the word "friendship", what comes to mind? Think about the women in your life that you are closest too, what characteristics do they possess that allow you to have that relationship? We would probably all define friendship in different ways and agree that there are different levels of friendship. We have those friends that we laugh with and have a good time with, we have friends that we can call in the middle of the night and cry with; those whom we enjoy a coffee date with now and then and those we can't imagine not seeing every day. No matter how you define it, friendship is a gift and must be handled with extreme care. I so appreciate the women in my life who cheer me on, who support me and truly want the best for me. But not just for me; for my family. Friends who value my kids and cheer on their success is very important to me. Friends who don't judge me for how I look or what I drive. Friends who you can't wait to share good news with, friends you can break down and cry with. I'm blessed to have several of these ladies in my life. What about you? Who are you blessed to call friend? Do you tell them, do they know how much you appreciate them? Never stop telling them. Never stop showing you care. Never stop sending that text of encouragement. Never stop complimenting. Never stop cheering them on. Never stop being interested in their lives. When you do this, you show the heart of Jesus. Jesus loved, served, gave, spoke life and invested in people. Proverbs 27:17 tells us, "As iron sharpens iron, so one person sharpens another." Help your friends be better, help them grow closer to Christ, confront lovingly when necessary and always vow to maintain honesty; promise to work through adversity. Be the kind of friend that you want to have. If you are looking for a friend who is kind, then be kind, If you are looking for a friend who is supportive, then be supportive. 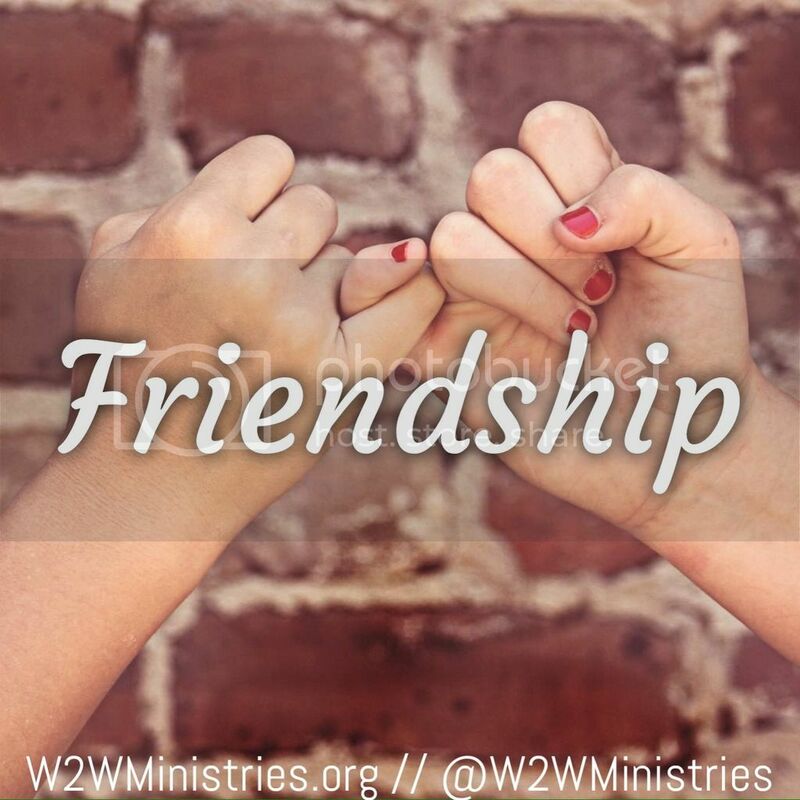 If you're searching for a friendship that is trustworthy and uplifting; well you know what I am going to say! I love the verse in Proverbs 18:24 that says, "A man that has friends must show himself friendly." I agree with this wholeheartedly. Be the kind of person that people want to be friends with. I recently spoke at an event that was a really big deal to me; because of the content of what I was speaking and the crowd whom I was speaking too. The day of, a sweet friend gave me a card and chocolate. It meant the world to me that she acknowledged that this was a big deal for me. Sometimes we just never know the power of a simple act. So let me encourage you to pray over your friends, tell them how much you appreciate them, take them out for lunch or send them a card in the mail. Let them know they are valued. In John 15 we are commanded to love one another as Christ loves us. When we do this, we are obeying his command; we are being Jesus to those whom have been placed in our paths. Thank you for stopping by, we love hearing from you. Please feel free to contact us with any prayer requests or questions by commenting below or emailing us at the About Us page. WE TRY TO ABIDE BY ALL COPYRIGHTS, BUT DO NOT ALWAYS KNOW WHERE TO GIVE CREDIT. IF YOU SEE A PHOTO ON THIS BLOG THAT IS YOURS AND WOULD LIKE US TO ADD CREDIT TO YOU OR REMOVE THE PHOTO, PLEASE KINDLY SEND AN EMAIL TO JENIFER@W2WMINISTRIES.ORG. THANK YOU. SOME OF THE LINKS ON THIS BLOG ARE PAID ADVERTISEMENTS. WHEN YOU SUPPORT THESE BUSINESSES, YOU ARE SUPPORTING THE MINISTRY OF WOMAN TO WOMAN MINISTRIES. THANK YOU.